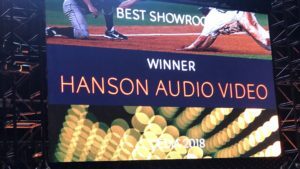 Hanson Audio Video located at 10800 Montgomery Road in Cincinnati won the prestigious 2018 CEDIA Showroom of the Year Award for the Americas Region consisting of North and South America. 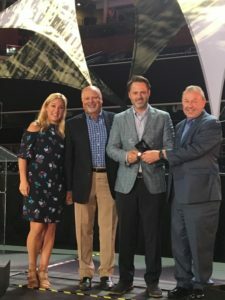 The award was announced and presented in San Diego on September 5, 2018 during the annual CEDIA EXPO attended by over 20,000 participants. CEDIA (Custom Electronic Design and Installation Association) is the leading global authority in the $14 Billion home technology industry. 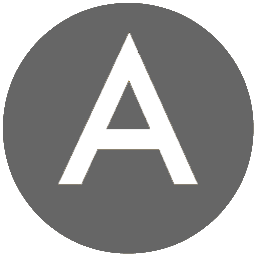 CEDIA represents 3,700 member companies and serves more than 30,000 industry professionals that manufacture, design, and integrate audio, video, and smart home products and services. 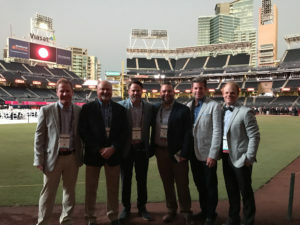 The CEDIA Award Ceremony was held at the Petco Baseball Stadium where Hanson was cited for their superior approach to educating customers on their products and services in addition to the way they allow customers to experience various smart home technologies, home theater and high performance audio products in their experience showroom.